This nurse has an excellent point about re-confirmation of NGT placement. 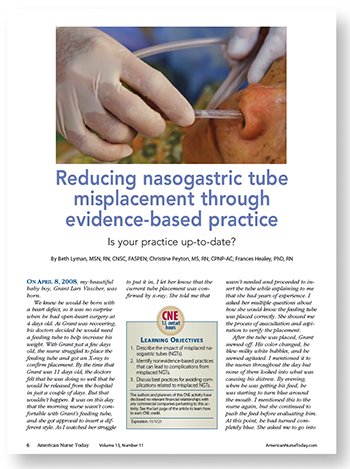 The major focus of our article is on initial placement, but it is definitely important to ensure the tube stays in place. She mentions tube migration and that does happen. For that reason, our nurses also document the centimeter mark at the nares periodically to ensure the tube has not moved (at least from that point). In the ASPEN Best Practice document just published in Nutrition in Clinical Practice we address this very issue. I agree with what the letter writer said and applaud her for commenting. I am writing in response to the article “Evidence-based practice: Medical device–related pressure injury prevention” (americannursetoday.com/medical-device-pressure-injury-prevent) by Gustavo Camacho-Del Rio, MBA-HM, MAP, BSN, RN. This article was both enlightening and compelling as [I am] an actively practicing RN with special interest in wound care and prevention. I was impressed with the content and scope of this article, but it was the format that fascinated me. Not many journal articles include bullet points and such delineated instructions, but this format is ideal for information that is designed to be put directly into practice. After reading [this] excellent article, there is no doubt in my mind that many pressure injuries could be prevented if every nurse providing direct patient care was able to have continuous access to the device-specific prevention tips included therein. I request that [the author] format this information into a ready-touse reference tool for all nurses to have at our fingertips when giving active patient care. I believe this would increase nurses’ awareness of medical device–related pressure injuries and, more importantly, how to prevent them. With this information in an easily accessible format, it could be referenced at a moment’s notice by a nurse without the time to read an entire journal article during a busy shift. Ideally, a resource page containing the information from [the] article, particularly the device-specific prevention tips, would be laminated and kept at nursing stations, or made available for nurses to make individual copies for their own reference. This would increase the accessibility of this knowledge to nurses and increase the likelihood of implementing these prevention methods. In my experience nurses retain and, more importantly, consistently use the resources they have in written form. I firmly believe if the information from this article were formatted into a ready-to-use reference tool for nurses to use while actively performing daily patient care, we would see a change in how the average nurse approaches prevention of pressure injuries. Nurses are more likely to apply information that they are able to reference quickly and in succinct form without pausing from performing patient care. Thank you for your time and consideration of this matter, as well as the resource your journal provides for professional nurses today and every day. I am writing in response to the article “The clinical opiate withdrawal protocol in an acute-care setting” by Barbara Leach, RN-BC, and Lynn Lieb, BSN, RN, CMSRN (americannursetoday.com/opiate-withdrawal-protocol). Use of opioids and opioid dependence seems to be climbing quickly in the area in which I work and live. I would say that more than half of the patients I encounter have some degree of opioid dependence. I feel that the article is touching on a major issue in the nursing profession and that more information should be published regarding the opioid epidemic and how nurses can help. I have had the opportunity to use the Clinical Opioid Withdrawal Scale (COWS) in a small hospital that almost always had an opioid withdrawing patient admitted. COWS is basically a checklist of different withdrawal symptoms [and their] severities. Upon assessing your patient, you will check what symptoms and what severity they are having. The score they receive determines the treatment they will receive. A lot of times withdrawal symptoms can be missed, or no protocol will be put in place to care for the patient. This happens because patients are not always truthful about their drug use or the nurse simply is unaware of the type of protocol that needs to be used. I feel that most emphasis is placed on alcohol withdrawal protocol while opioids and other substances are often overlooked when it comes to making sure staff is competent in these protocols. Once the COWS protocol was put into place in the hospital [where I worked], I feel that more awareness was brought to these types of patients and better care was provided. The article “Opioid use disorder: Challenges during acute hospitalization” [published in the] Journal for Nurse Practitioners states: “Unidentified and untreated illicit drug use is a major predictor for leaving against medical advice and is linked to negative health outcomes including death.” This does not apply only to hospitals. In the article, “Opioid withdrawal deaths in jails: Preventable if medical standards followed” in Alcoholism and Drug Abuse Weekly, the author writes: “There have been increasing reports of deaths in jails due to opioid withdrawal-deaths that could have easily been prevented by appropriate medical care.” It is evident that being aware of and treating withdrawal appropriately is essential for providing adequate care. It is obvious that the opioid crisis is a growing issue in the medical field and not all nurses and providers are aware of how to treat it. As stated above, many deaths that occur from withdrawal could be prevented if the appropriate care is provided. I feel that COWS is a great start to addressing and treating the issue. If more information were published regarding the opioid epidemic, I think more nurses would become aware and take initiative to implement protocols if they are not already in place. Knopf A. Opioid withdrawal deaths in jails: Preventable if medical standards followed. Alcoholism and Drug Abuse Weekly. 2016;28(29). I am writing in response to the article by Leah Heather Rizzo, MSN, RN-BC, CENP, “Suicide among nurses: What we don’t know might hurt us” (americannursetoday.com/suicide-among-nurses-might-hurt-us) because [it] addresses a contemporary nursing issue that elicits a professional response in me. This article immediately drew me in. I hope to be able to add to this discussion from some of my experience as a nurse, and as a staff member of a behavioral health unit. I appreciate the information in the article and find some of the numbers astounding. The author really hit the nail on the head by stating that no one is “immune” to suicide. I started working as a psych nurse almost 3 years ago and it never ceases to amaze me how many people you would never expect to see suffering from mental illness, mostly depressed or suicidal, walk through our doors. I agree that we need to increase our knowledge of suicide in the profession. When working in the hospital setting, new employees are expected to sit through countless hours of education about how to use the information systems, policies and procedures, dress code, salary, and retirement plans but what about how to better care for our own well-being? In a profession where we are constantly giving of ourselves to others, we so often neglect to think about our own health. I would like to see organizations implement “employee wellness” classes as part of new employee orientation and offer information on mental health and how to get help. This article had a very informative section that identified “red flags” and how to take action when you see them. This is the kind of information educators, leaders, management, and staff should have access to. Hang it on the walls of the bathroom, in the nurse’s station, in the copy room, in mailboxes, and get people talking about it more. Healthcare workers in crisis should feel safe to talk about their mental health with management or coworkers so they can get the help they need. If organizations can foster that safe environment from day one of employment, I envision they would not only feel cared about, but the door would already be open to those sometimes-uncomfortable conversations. The subject of suicide just isn’t talked about enough in our profession. I hope that in the future there will be more research and education in our hospitals and other healthcare facilities that will promote positive work environments. If we can open the lines of communication and educate ourselves and others, it is my hope that we can one day break the stigma of suicide. The “Screening and management of hepatitis C” (americannursetoday.com/screening-management-hepatitis-c)…ironically upheld perhaps the greatest myth of hepatitis C (HCV): that the population primarily affected by HCV are people born between 1945 and 1965 (baby boomers). While baby boomers make up the largest group of people living with an HCV infection, a younger generation of people newly becoming infected with HCV is quickly rising, largely attributable to injection drug use associated with the opioid epidemic. This changing epidemiology presents a major public health issue—one that nurses should be aware of and have the ability to end. The article first failed to discuss how HCV spreads and why we see high rates of HCV among certain populations. HCV is spread through bloodborne transmission. The prevalence of HCV is high among baby boomers not because of injection drug use, but because of inefficient medical infection control practices (for example, during mass vaccinations and unscreened blood transfusions), which occurred before the virus was discovered in 1989. Since we have modern medical infection control precautions to prevent the spread of bloodborne pathogens, most people who become infected with HCV today acquire it through injection drug use. There also may be a link between sharing straws to snort drugs and the spread of HCV. Therefore, the reason why we see high rates of HCV among baby boomers and among young adults are for different reasons. Adults age 20 to 39 years now represent the largest group of people who are transmitting and becoming infected with acute HCV. In 2016, there were approximately 41,200 people who acquired acute HCV in the United States, and about half of the reported incidence was among people age 20 to 39 years. Because we are seeing more people of reproductive age living with HCV, we also are seeing more infants born to people who are infected with HCV. Nationally, approximately 1 in 308 infants are born to a person who is infected with HCV. This is important because there is a 6% risk that HCV can be transmitted vertically—meaning the transmission of the virus in utero or during labor from pregnant parent to infant. For HCV, there are no perinatal interventions to reduce vertical transmission. The only way to prevent vertical transmission of HCV is to treat and cure people with direct-acting antiviral therapy before they become pregnant. Therefore, screening and treatment is imperative for people of reproductive age. Whereas universal HCV screening is recommended for baby boomers, risk-based screening is still recommended for everyone else. What this means is that providers need to ask, and a patient needs to disclose a risk factor (such as injection drug use) to get tested for HCV. What we do not know is whether providers are asking, and whether patients are disclosing a risk factors, given that disclosing that the patient injects drugs could lead to stigmatized care or legal consequences. Due to the changing epidemiology, researchers are exploring whether HCV should become a routine test among the non-baby boomer groups. Until HCV becomes a routine test, nurses should make sure that risk-factor questions are asked among all non-baby boomer groups and nonstigmatized care is provided to those who disclose a risk factor. While highly effective direct-acting antiviral treatment exists, this treatment is not accessible to all people who are living with HCV. The issue isn’t insurance coverage, as described in the article. The issue is that insurance companies place restrictions on who is eligible for treatment. These restrictions include things like the patient has to have advanced liver disease, be sober, or be prescribed the medications by a specialist. For young adults living with HCV, it can be particularly challenging to get treatment. Nurses should know their state Medicaid program HCV treatment restrictions and advocate for equitable treatment for all people who are living with HCV (stateofhepc.org/report/). Finally, the article did not discuss a key component to HCV: prevention. We can prevent HCV transmission and infections through harm-reduction interventions, such as syringe exchange programs and safe injecting sites. Syringe exchange programs and safe injecting sites provide access to free and sterile drug use equipment, safe disposal of used equipment, naloxone, free HCV and other bloodborne pathogen testing, comprehensive risk-reduction counselling, and many other services. These programs are safe and effective at keeping people who use drugs healthy, alive, and HCV-free. Every nurse should know where their local syringe exchange programs are and should provide patient education about where patients can access new injection equipment (nasen.org/map/). While the article outlined screening and treatment for baby boomers, the article neglected to dispel the myths of HCV, discuss the existence of a major population that is newly acquiring HCV, explain how screening and treatment is unique for the younger generation, and identify how to prevent the spread of HCV through harm-reduction interventions. Nurses need to understand the full story of HCV. With competent patient education, compassionate care, and advocating for better HCV polices, nurses can be fundamental to ending the HCV epidemic. Benova L, Mohamoud YA, Calvert C, Abu-Raddad LJ. Vertical transmission of hepatitis C virus: Systematic review and meta-analysis. Clin Infect Dis. 2014;59(6):765-73. Fernandez N, Towers CV, Wolfe L, Hennessy MD, Weitz B, Porter S. Sharing of snorting straws and hepatitis c virus infection in pregnant women. Obstet Gynecol. 2016;128(2):234-7. Houghton M. Discovery of the hepatitis C virus. Liver Int. 2009;29(suppl 1):82-8. Koneru A, Nelson N, Hariri S, et al. Increased hepatitis C virus (HCV) detection in women of childbearing age and potential risk for vertical transmission—United States and Kentucky, 2011–2014. MMWR Morb Mortal Wkly Rep. 2016;65(28):705-10. MacArthur GJ, van Velzen E, Palmateer N, et al. Interventions to prevent HIV and Hepatitis C in people who inject drugs: A review of reviews to assess evidence of effectiveness. Int J Drug Policy. 2014;25(1):34-52. Patrick SW, Bauer AM, Warren MD, Jones TF, Wester C. Hepatitis C virus infection among women giving birth—Tennessee and United States, 2009–2014. MMWR Morb Mortal Wkly Rep. 2017;66(18):470-3. Watts T, Stockman L, Martin J, Guilfoyle S, Vergeront JM. Increased risk for mother-to-infant transmission of hepatitis C virus among Medicaid recipients—Wisconsin, 2011–2015. MMWR Morbid Mortal Wkly Rep. 2017;66(42):1136-9. Zibbell JE, Asher AK, Patel R, et al. Increases in acute hepatitis C virus infection related to a growing opioid epidemic and associated injection drug use, United States, 2004 to 2014. Am J Public Health. 2018;108(2):175-81. The editorial “Why hospitals dislike their best customer: CMS” (americannursetoday.com/hospitals-dislike-best-customer-cms) by Leah Curtin, RN, ScD(h), FAAN, is excellent. Each point made is legitimate and unfortunately true. Value-based reimbursements and provider risk will continue to grow. Paying for value is the norm when we make purchase decisions starting with basic necessities like food to retail items. Healthcare providers, including hospitals, are being introduced to this concept—and yes, we need to listen to and like our best customer.